Yesterday I ran out of Aunt Jamima pancake mix and I said to my girlfriend "I gotta buy some more Aunt Jamima." And she said "Buy mix? I always laugh when people do that." And I said "What do you mean?" And she said "I make pancakes from scratch." So I figured I'd look up a recipe here. It took a while to find one that I wanted to try (I was tempted with the fluffy Canadian ones 'cause I'm Canadian) but then I saw all the reviews for this one and it sounded good. I was really hungry tonight so I got out my griddle. By the way, if you do like making pancakes, I highly suggest investing in a griddle, preferably iron. Breakfast food tastes SO much better on a griddle, and there's much more space to cook and flip. You can cook 6 pancakes on my griddle at a time. ANYWAYS I tried this recipe, and I made the pancakes, and KUMBAYAH they were the best pancakes! The pancakes were fluffy, and mouth watering, and tasty, and soft. 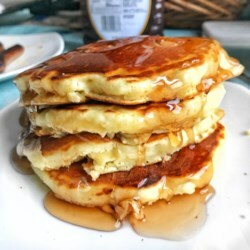 The only change I made was adding an extra quarter of a cup of milk because I like the pancakes to be a little thinner and when I mixed the batter up I saw they'd be too thick. These are the best pancakes I've ever eaten. Thanks Verona, and Grandma Verona!